We keep tweaking the wild flower bed. When the new beds were dug in the Memorial Gardens over the winter of 2013-4, there were many different plans for them, but the one thing everyone agreed on was that the bed nearest the car park should have a great display of poppies. This was broadened to include the standard cornfield annuals mixture to make the display last longer, with a band of poppies first, then cornflowers, then oxeye daisies. This was spectacular that first year, and the poppies were allowed to seed and regrow the second year, when they made a great display again. 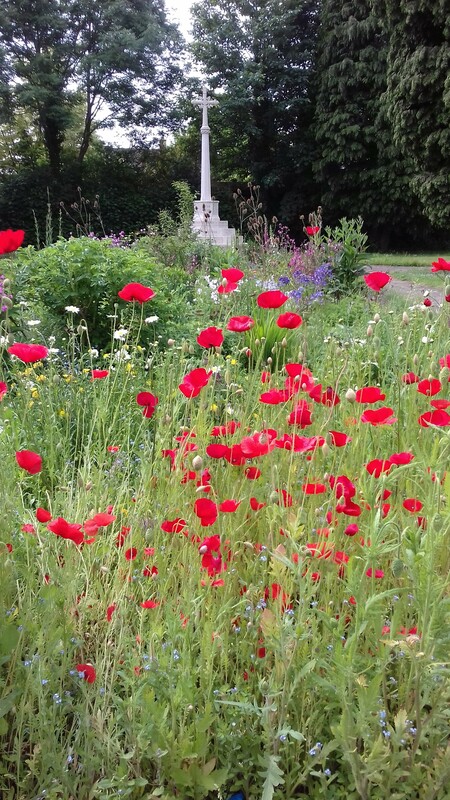 The stalks and seedheads were left as food for birds and insects, and for insects to hibernate in, which led to a few complaints that the gardens looked messy and disrespectful of its setting, particularly for the services on Remembrance Sunday. So we began to manage the gardens in a slightly different way, but always kept that first bed for the poppy display, letting some of the seed fall on the ground, and resowing in the autumn and spring (because we don’t quite trust ourselves, and there’s only one chance to get it right for the display every year). A couple of regular passers-by congratulated us this week for managing to get the poppies flowering four years running – apparently it’s notoriously difficult to get them to come back year after year. They don’t just like disturbed ground, they like newly-disturbed ground (the best displays are round the edges of road-building sites). And of course, poppies became a symbol of remembrance after the first world war, as they covered the ground that had been battlefields in northern France and Belgium. We also followed the usual advice for bee-friendly native plants, and sowed other cornfield annuals, mainly cornflowers and oxeye daisies. Usually they’ve all done well, especially the oxeyes which do tend to take over, as a trip along the M25 to Heathrow reminded me this week – white daisies everywhere, but nothing else left from the wild flowers they sowed. This year, the cornflowers suffered with the cold wet winter, and the few tiny plants that did make it through were mostly finished off by the cold snap in April. We’ve been experimenting with more perennial wild flowers in the other half of the bed, but that’s for another post. 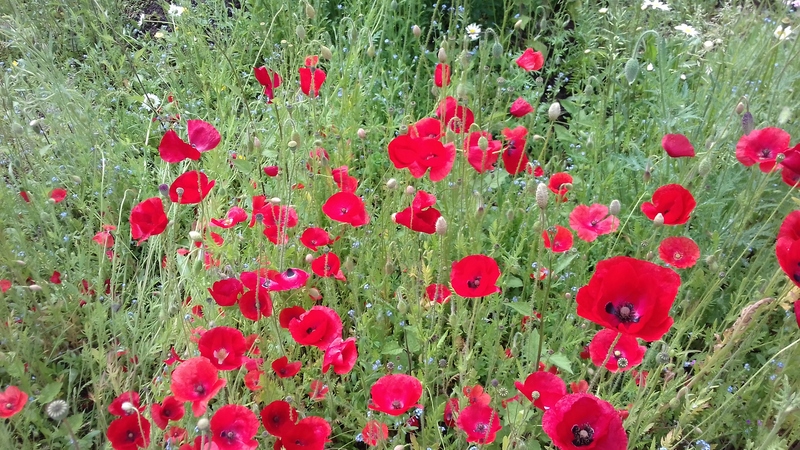 We’re very aware that June’s great display of poppies could easily become November’s ‘weed bed’, as one disgruntled local business-owner put it. So the cultivation the poppies need also helps to keep the place tidy as we not only cut down the stalks and seedheads, but remove the plants completely, resow, and fork the soil over One of the many compromises of wild flower gardening is that clearing the plants away every year means that we destroy the understory of stonecrop, black meddick and forget-me-nots that arrives with the poppies in the spring. It’s a bit untidy, but we generally leave it that way as long as the poppies themselves seem to be thriving, as we’ve noticed that those lower-growing plants are just alive with insects: the bed as a whole seems to be a mini-ecosystem. So far it’s worked – here’s this year’s display, just starting. Something to enjoy for the next month! And then the cycle starts all over again with seed-saving, clearing the plants away, forking the ground over, and resowing for next year. 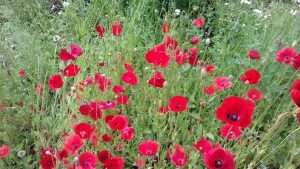 This entry was posted in Uncategorized and tagged bee magnet flowers, growing wild flowers, poppies on May 31, 2018 by Pippa Sandford.